Minister for Transport Dr. Leo Varadkar published a review of the penalty points system on Monday 11th June last as we reported here. The review was carried out by the Department of Transport, Tourism & Sport and compares Ireland’s penalty point system with ten other jurisdictions. While we in MAG Ireland welcome some aspects of the review, such as the proposal to increase penalty points for the use of a handheld mobile phone, we also have some reservations in regard to the way motorcyclists are portrayed. The review itself opens with an analysis of fatal road traffic accidents using data from 2009. This section tells us little we didn’t already know, and serves primarily to set the context for the remainder of the document. Of note is the fact that driver error is the primary contributory factor in more than nine out of ten fatal collisions (92%), with pedestrian error (5%) and road factors (3%) stated as the next most significant. This section also notes that in 2009, motorcyclists accounted for 11% of fatalities but only 2% of traffic, a fact which the review describes as a “disproportionate number of deaths”. The review then goes on to look at the primary causes of fatalities vs the penalty points applicable to those causes (where appropriate, as not all causes are road traffic offences). For single vehicle accidents (SVA’s), the stated primary causes are speed, fatigue and alcohol/drug driving while the causes of multi vehicle accidents were, unsurprisingly, somewhat more complex. Given the focus on single vehicle accidents, and the fact that the review attributes just 3% of fatal accidents to road conditions, it has long been our view that prior to the introduction proper forensic collision investigations a small but statistically significant number of fatal accidents were misclassified as driver error by Gardai who were, at that time, given no specialist accident investigation training. However, the review next turns to motorcyclists, and this is where it becomes apparent that the authors fell foul of the usual stereotypes. The first sign of prejudice we encounter is the blatant and unsubstantiated equation of “motorcycle drivers and speed etc.” which is particularly galling given that there is no evidence which suggests that motorcyclists are any more or less likely to speed than are drivers of other vehicles. Based on that false and offensive claim, we next encounter the suggestion that riders be treated as “novice drivers”, in other words subject to double penalty points. The deliberate inclusion of the previous twelve years worth of combined fatalities is purely pejorative given that it goes back some five years before penalty points were first introduced in 2002 and has clearly been done to get the highest headline number possible. 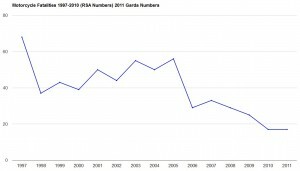 Had the authors bothered to ask MAG Ireland, or even to read the MAG Ireland web site, they would no doubt have been aware of the following graph which shows the real picture – that motorcycle fatalities have been falling steadily for some years now, and are currently at historic lows – as well as the likely reason the authors included 1997 (68 deaths), one of the worst years on record for motorcycle fatalities. We have previously noted that the downward trend from 2005 onward correlates to the big increase in the number of riders taking post test training and the introduction of assessments by insurers. We in MAG Ireland find the suggestion that riders be treated as “novice drivers” downright offensive, particularly so in light of the fact that riders, as a group, are the most likely road users to have taken post test training. Cyclists aside, no other road user group has had such a significant reduction in fatalities over the past ten years. 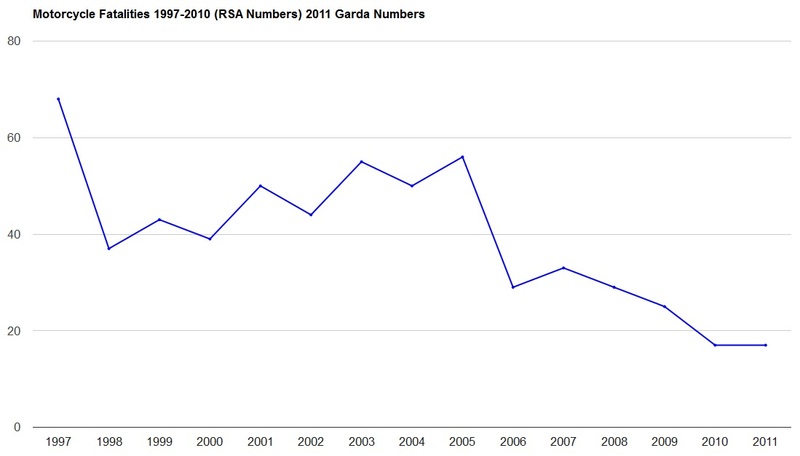 The reality, as we reported here is that between 2001 and 2010 the number of motorcycle fatalities fell by two thirds. We in MAG Ireland are disappointed, though not entirely surprised, to see that once again we are faced with a case of policy led evidence instead of evidence led policy. Frankly, it’s just not good enough, and we in MAG Ireland will be communicating our views to the minister in this regard.